National Instruments has released NI cRIO-9012 high-performance, real-time controller in collaboration with Freescale Semiconductor (NYSE: FSL, FSL.B) and Wind River (Nasdaq: WIND). The NI cRIO-9012 controller is based on Freescale’s MPC5200 processor built on Power Architecture technology and Wind River VxWorks real-time operating system (RTOS) to deliver fast performance while maintaining the ruggedness, reliability and low cost of the NI CompactRIO platform. The companies are working together to help engineers simplify embedded system development through graphical system design, which combines open software and commercial off-the-shelf (COTS) programmable hardware in a single, unifying platform to rapidly design, prototype and deploy embedded systems. The collaboration on the cRIO-9012 controller illustrates the three companies’ ongoing strategic relationship dedicated to improving the development of embedded devices. In addition to increased performance, the cRIO-9012 controller incorporates proven technologies from all three companies to deliver more memory and nonvolatile disc space as well as more digital signal processing and faster streaming for logging and networking than its precursor, the cRIO-9002 controller. Freescale’s 400MHz MPC5200 processor, containing an integrated floating-point unit, is well suited for networking, media, industrial control and automotive applications. The MPC5200, which is programmed with the National Instruments LabVIEW Real-Time Module, gives the cRIO-9012 controller up to 4X processing performance and nearly 2X lower power consumption. Running on the MPC5200, the Wind River VxWorks RTOS delivers dependable performance and a fault-tolerant file system that provides reliable data logging, making it possible for engineers to operate the controller for long periods of time in remote applications using a battery or solar power. 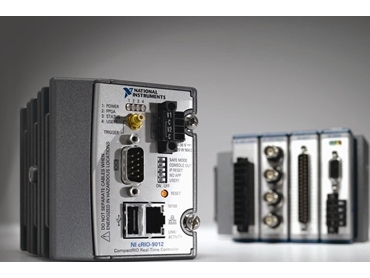 The NI LabVIEW Real-Time Module provides shared variable technology for simplified network communication between distributed systems as well as the new LabVIEW Project, which streamlines code control and application deployment to multiple CompactRIO systems. With the technologies in the new cRIO-9012 real-time controller, the CompactRIO embedded system is ideal for applications such as machine control and monitoring, in-vehicle logging and embedded system prototyping and for a variety of industries such as automotive, military, industrial equipment and energy and environmental. Engineers require a development platform that helps them create embedded system solutions more quickly, with higher quality and with lower costs. The collaboration with National Instruments is bringing the benefits of Power Architecture technology and Freescale’s MPC5200 processors to the CompactRIO graphical system design platform, which gives engineers a more streamlined approach to embedded system development. Using a standard architecture and COTS components, graphical system design helps engineers streamline the development process and quickly prototype and deploy new designs without the need to build custom embedded systems for every project. The openness of the graphical system design approach also gives engineers the opportunity to incorporate and take advantage of state-of-the-art technology from multiple vendors. With the CompactRIO graphical system design platform, for example, engineers benefit from the processing speed of the MPC5200 processor and the dependability of the Wind River VxWorks operating system in the controller as well as the customization of a Xilinx chipset in the reconfigurable chassis. Engineers also can take advantage of the reliability and ease of use of the graphical programming tools in LabVIEW to target the VxWorks operating system and Xilinx FPGA. The combination of these technologies in a single platform makes graphical system design an ideal methodology for embedded system design. According to Wind River, device software has been exponentially increasing in complexity, which makes it much more challenging for engineers to be productive and the graphical system design is a valuable methodology for moving customised device software from design to deployment quickly. The combination of state-of-the-art VxWorks RTOS technology, easy-to-use LabVIEW rapid development programming tools and the CompactRIO platform provides device software engineers with a powerful and flexible foundation for their design, so they can focus on the complete system and delivering the features their customers care about most.